I have previously written about Evolve Money and my excitement with being able to pay my bills with a debit card. If you have not tried using Evolve Money to pay a bill yet, now is a good time to give it a try. 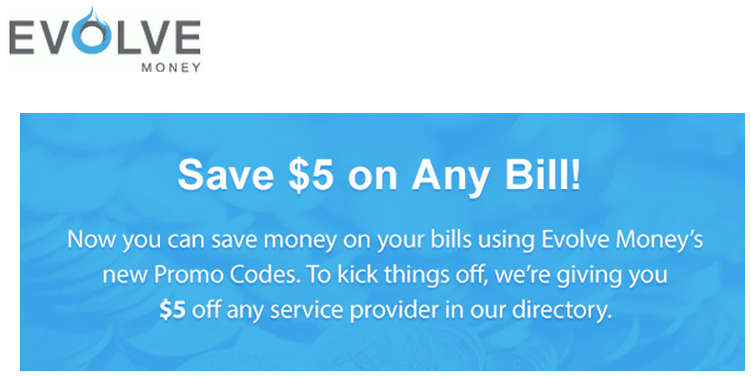 I just received an email from Evolve Money with a promo code to save $5 off any bill. Who can say no to a free $5? Not me! After you’ve banked five bucks, reward your friends and loved ones by sharing the Promo Code. Tweet it. Post it. Pin it. Be old-school and forward this e-mail. Redeeming the code is a snap. Log in to your account at www.evolvemoney.comfrom your computer or mobile device. If you don’t have an account, just choose “Sign Up” from the main page and create a User Profile. the Promo Code box enter the code below and choose “Apply”. › Submit your payments and automatically receive $5 off your bill. There will be many more promo codes throughout the year. Be sure to Like, Follow and Circle us for details. You can sign up for your own Evolve Money account here.